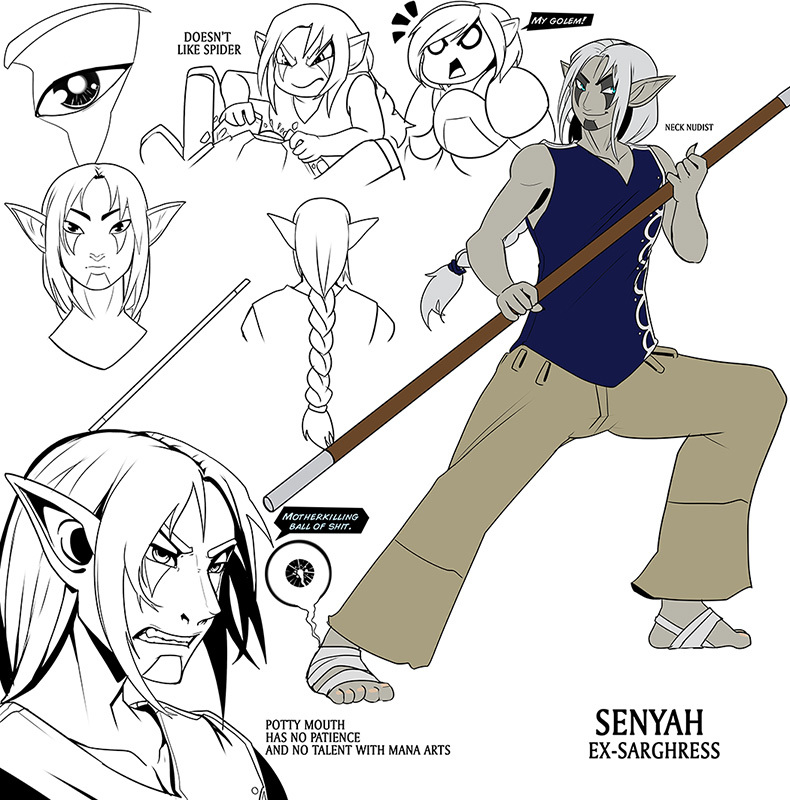 Senyah wears a blue shirt and light coloured pants with his white hair tied into a braided ponytail. Unusually, he doesn't cover his neck. He has no patience and dislikes spiders. Senyah attended the Felde peace conference. After Ran’diirk’s failed attempt to kill Snad, he attended Snad’s speech where he states that he didn’t see any Sarghress in the crowd and asks who would deal with Quain’tana. When Shodun gave the command, he kneeled. "''I haven’t seen any Sarghress in the crowd today. Who could possibly deal with Quain’tana!?''" Sorm'nal's dragon Baef catches Nau spying on him, Sarai and Randiirk. The three interrogate him. Sorm'nal and Sarai didn’t believe the truth that Snad is behind this but they did believe the lie that Kharla is the mastermind. Later he enters the building alongside Sarai. He attempts to comfort Sarai after Ran'diirk died attempting to kill Snad.